Last post I wrote about Japanese garden fall color. This post is about my favorite area for it. 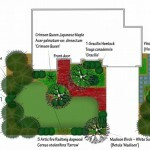 I also cover what you can learn from this Japanese garden fall color use in creating your garden sanctuary. The area is the path to the tea garden. I have never been able to completely capture it in a picture. Not only is it hard to photograph, it is also short lived. For about one week in the midday the area glows. The tea garden meanders through plantings of sugar and red maples. As you walk down the path you pass through a scene that glows with varying shades of yellow, orange and red light. This is an effect to be experienced. It is similar to walking through a sugar maple forest, but exists in a much smaller area. It also has distinct color changes as you pass under each tree with a different color of light. The path lit mainly in yellow now, as most of the pinkish tones produced by the red maple leaves has left as the leaves have fallen. So what makes this Japanese garden fall color effect? Let us analyze this scene a bit. Different cultivars of maples whose leaves get different fall colors. Light passes through these translucent leaves as well as bounce off them. 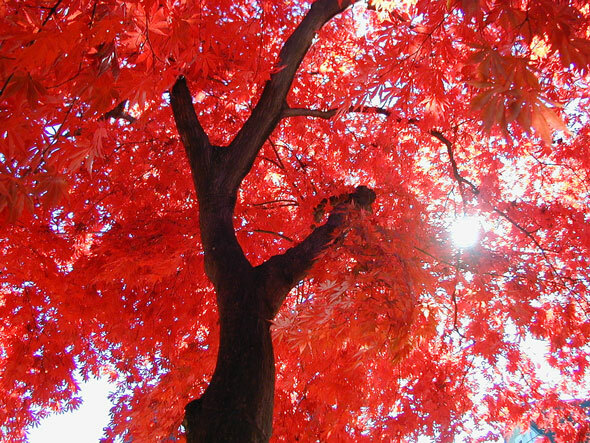 This creates light that is colored pinkish, orange or yellow depending upon which tree you are under. A light colored exposed aggregate concrete path to walk on. This reflects the colors up from the ground, so that the colored light immerses you from both above and below. So even if you are looking down as you walk, you still get the effect. If this was a dark colored path the effect of this area would be lessened greatly. This is a subtle but very important point. Closely planted columnar forms of maple trees. The columnar form means that they grow mostly up and do not spread out too wide. This allows them to be planted close together. This closer planting means that the area under each tree is smaller and allows for quicker color changes as you walk down the path. If these trees were 40 feet wide each, the color that was reflected under each tree would only change after you walked about 40 feet. By planting trees that stay 15 feet wide, the changing color effect can happen much more rapidly as you walk down the path. Another point in the placing of trees is the color changes with each tree. 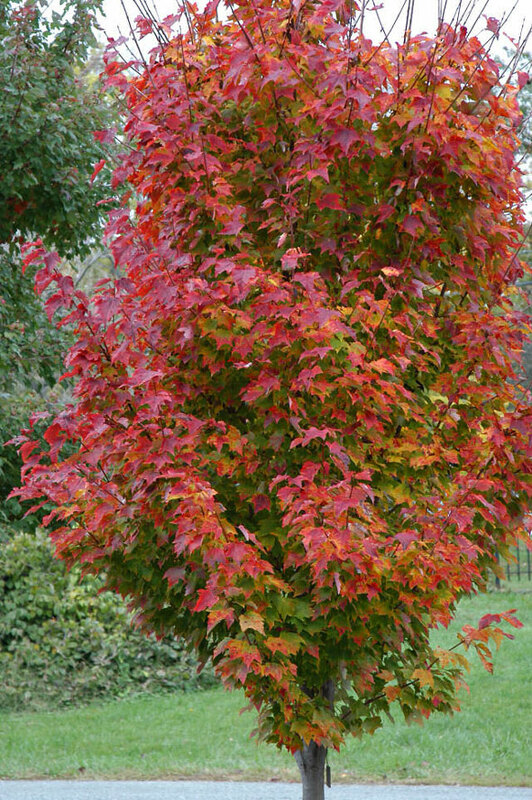 A red maple cultivar with yellow color, then a sugar maple with orange color, then a red maple with red color, etc. How can you create this Japanese garden fall color effect in your yard? Anywhere you can space these trees to grow together that is in full sun, you can create this Japanese garden fall color effect. If you put them in an area where you walk through or sit, you can enjoy it. If the path or patio is a lighter color such as concrete or light stone this effect will be more pronounced. Here is an example of how you could layout a path with columnar maples. Remember however, where the sun will be when these trees are turning color. For instance it will be in the southern sky. Therefore, if I placed trees around my patio, the ones on the north side of my patio would be less effective than the ones on the south side of my patio. These trees are all an upright forms that stay narrow. These would be suitable to plant 10 feet apart to create a grove. 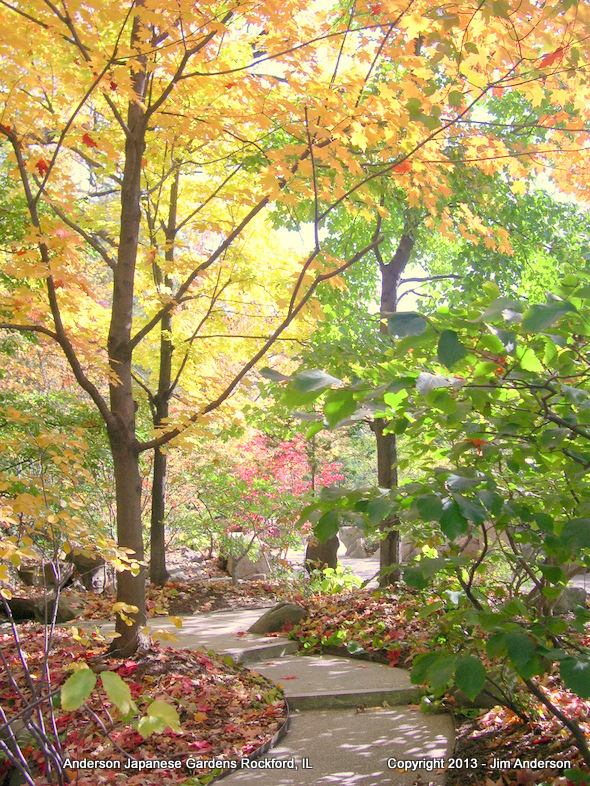 Note some of these maple trees may not color as much in warmer climates. Most people are not familiar with the Black maple (Acer nigrum). 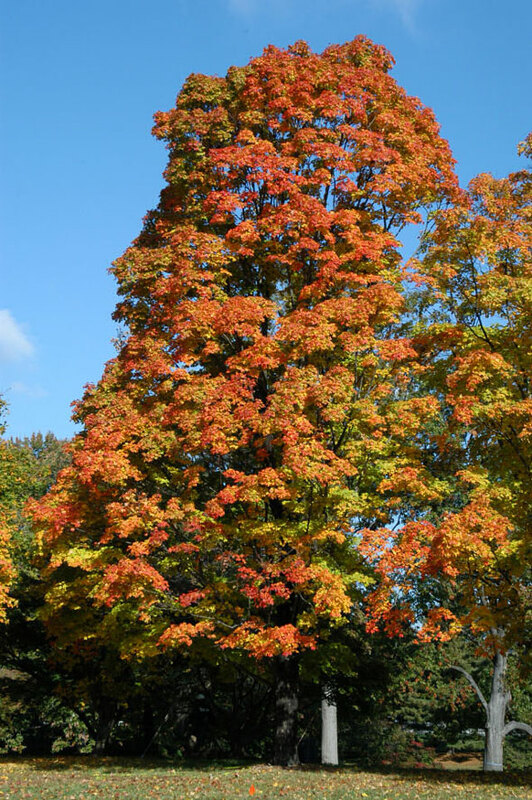 It is a close relative of the Sugar maple and seems to have greater heat and drought tolerance. It does grow a bit slower than the sugar maple. 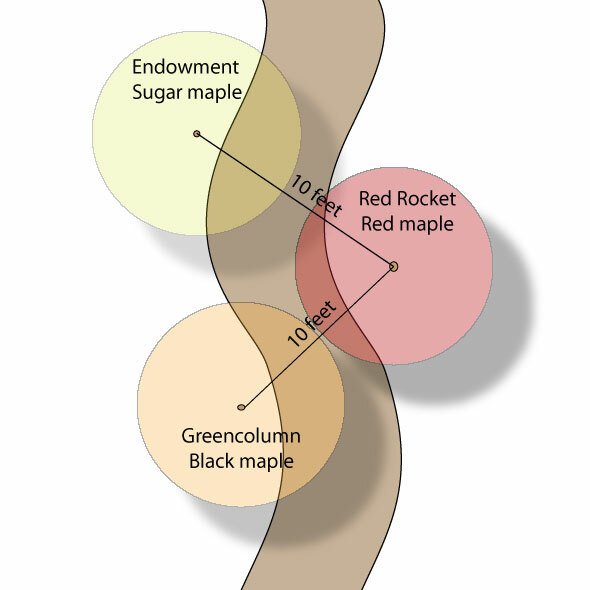 Greencolumn Black maple is pretty common at nurseries. Are similar in size and growth speed – You don’t want one tree taking over the space. Are tall enough to create shade for the area – Hybrid Witchhazels have excellent fall color; however most don’t get tall enough. Have thinner translucent leaves – Ornamental Pears for instance have great fall color, but their leaves are too thick for this effect. Thinner leaf trees such as maples, birches, etc. allow light to pass through them better. Maybe you are not quite ready to commit to planting a bunch of trees but would still like to enjoy this Japanese garden fall color light effect in your landscape. One idea is to have autumn colored light enter your window as you wake up in the morning or are eating dinner in the evening. To do this you could place a tree that has a translucent leaf that turns a nice fall color next to a window. Place the tree(s) on west side of the window for evening effect. The smaller the tree the closer to the space it would need to be. As you move the tree farther away from the house you will want to move it slightly to the south. This is so the shadow it casts at the time you want this effect is on the window. 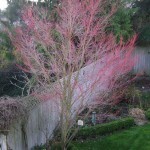 The best trees for this in my opinion are Japanese maples (Acer palmatum and Acer japonicum). 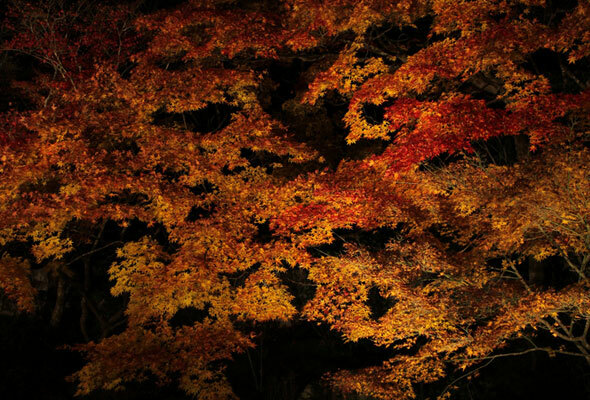 Some even have a spring leaf that is translucent and colored(Fireglow). 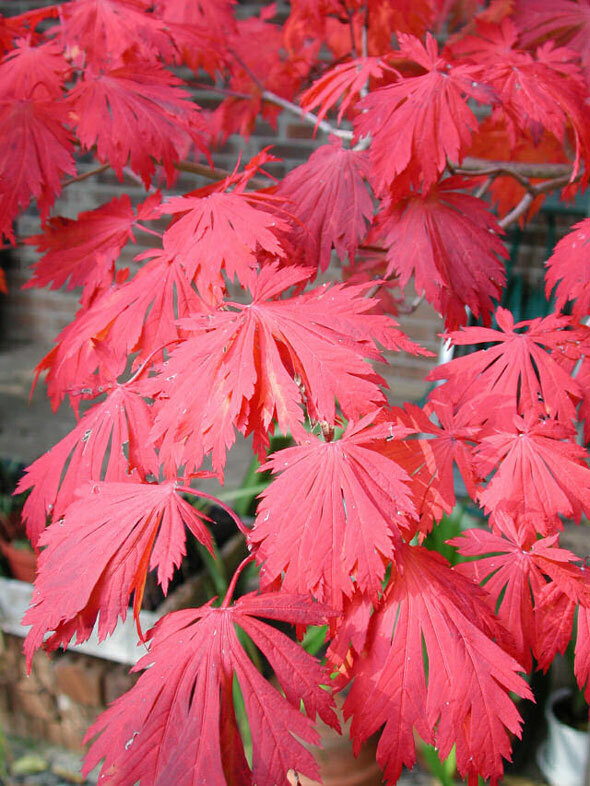 My two favorites are the Dancing Peacock Japanese maple (Acer japonicum ‘Aconitifolium’) and the Fireglow Japanese maple (Acer palmatum ‘Fireglow’). Another cool thing you can do is up light them at night with some landscape lighting. Their colored leaves can glow. Last post I wrote about Japanese garden fall color. This post is about my favorite area for it. Hopefully it has given you an idea of a way you could add a similar Japanese garden fall color in creating your garden sanctuary. The soft, diffused colored light is magical. I love it!!! How needy are the maples you listed when it comes to soil pH? We are sl alkaline here in Utah. They are not going to like real alkaline soil. The black maple may do ok. Exactly how alkaline are we talking here, 7.6 or 8.2?